One of the most challenging (and dreaded) tasks in facility management is predicting future costs. As stewards of the built environment, the facility manager (FM) must learn to manage the workplace on a day-to-day basis while predicting future needs, costs and organizational requirements. Budgeting for future costs requires some skill in economics, not just in finance. Since economic and cost factors are constantly changing, there is no single way to create a formula for success. The most successful FMs know that the only constant is change. Being an effective manager is not about having a good plan, it’s about having a good strategy. This article helps illustrate the benefits of taking a strategic approach to extending the life expectancy of our facility assets. At the beginning of the facility life cycle, designers place a lot of emphasis on sustainable facilities that deliver safe, healthy work environments. Energy and water efficient buildings, judicious use of materials and resources, proper site use, and healthy indoor environments drive the strategy for designing, constructing, and delivering sustainable facilities. Once that facility is delivered, the FM is tasked with maintaining those sustainable features, while managing operational and capital costs. Today’s pressure on reducing facility cost often challenges our ability to maintain facilities to the same level of efficiency and environmental stewardship intended in the design, construction, and delivery phase. In order to deliver safe, efficient workplaces, the facility manager has to consider how a facility is designed and how it is expected to perform over its life cycle. There are several strategies that can be considered in effort to manage and reduce life cycle cost. 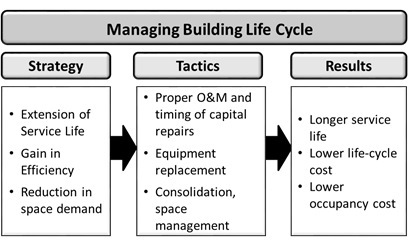 Figure 1 shows three viable strategies for managing life cycle cost, without compromising the principles of environmental stewardship. Strategies that maximize efficiency and optimize space-use receive a lot of attention in facility management and are the focus of FM technology solutions such as building automation, energy management, and work management systems. FM technologies such as Integrated Work Management Systems (IWMS) and Computerized Maintenance Management Systems (CMMS) are very helpful in tracking facility assets and managing work processes to increase efficiency and effectiveness. The concept that seems to attract less attention is the extension of service life. Perhaps that’s because the methodologies we use to extend service life are less clear and harder to define from a financial perspective. The two primary methodologies we would use to extend service life are proper operations and maintenance, and proper timing of capital repairs and equipment replacements. It is challenging to determine how the level of maintenance impacts the expected service life of a building system or major component of a building system. It is intuitive that poor levels of maintenance could easily lead to premature failure and shortening of service life. But how much maintenance is required, and is “extra” maintenance required to extend service life? How is expected service life determined? Baseline maintenance requirements and service life expectations are set by the manufacturers of systems and equipment. Most designers and facility managers take this information for granted. Equipment manufacturers evaluate equipment reliability. Reliability is normally based on some level of statistical analysis and relies on averages derived over a large distribution of data. Is this data reliable? In short, yes. But that doesn’t mean that every system and every component sold and installed will behave in an “average” manner. Reliability is based on a number of factors, and the level of maintenance required over the equipment’s service life is one of those factors. In facility management, we rarely delve deeply into equipment reliability theory, and usually trust the “averages” the manufacturer provides us. Relying on manufacturers data to predict service life isn’t a bad way to set expectations, but since there is significant economic impact on our operating and maintenance budget, we should pay closer attention to how long our systems last. So how do we make decisions on how long our systems and equipment are expected to last, and how do we make them last longer? The service life of a facility asset is normally expressed in terms of Estimated Useful Life (EUL). EUL is most often accepted in the design and facility management community as the life expectancy provided by the equipment or system manufacturer. The EUL is based on an expected level of maintenance. This is much like your car – the auto manufacturer requiring routine maintenance in order to meet expected service life expectations (oil changes, filters, tires, routine inspections, etc.). 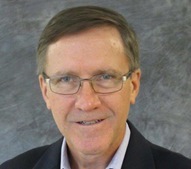 There are two primary strategies for extending the service life of a facility asset. The first is the design choice. The design choice is made early in the life cycle process, and again when systems and components are replaced during the capital renewal process. The design choice consists of choosing systems, equipment and components that are durable, have a proven track record (manufacturers EUL), and are easily maintainable. Determining a capital renewal budget for major building equipment and system replacements is an annual requirement for most facility managers. This is another opportunity to make design choices that are durable, maintainable, and have a longer life expectancy. The second is the amount of preventive maintenance applied to the asset. Preventive maintenance tasks that go beyond the manufacturer’s recommendations as the asset ages may help to extend the service life. Preventive maintenance (PM) is performed in a programmatic manner by the FM organization and its success is usually judged based on the amount of PM performed and timeliness of performing PM tasks. PM is rarely linked to reliability and the level of PM is not always used as an indicator of expected useful life on a component (individual piece of equipment) basis. Let’s start with a simple example of a building system that’s common to thousands of facilities – a chiller. If we assume that a chiller replacement in our facility has a baseline cost of $500,000 and an expected service life of 20 years in our climate zone (the figure provided by the manufacturer), can we expect to save money if we can extend service life past 20 years? Intuitively, we would say yes, of course, but how much? The example below shows the expected ownership cost reduction of a chiller that has an EUL of 20 years, and is maintained to run for 25 and 30 years respectively (expressed as Present Value (PV)). If these risks are deemed acceptable and affordable, extension of service life beyond expected useful life is an effective way to reduce life cycle cost. The chiller example reveals potential savings of over $70,000 (about 10%) when the service life is extended past the EUL by 10 years. The way to determine if service life extension is a viable strategy is to balance the expected savings from cost avoidance against the expected increase in maintenance needed to keep equipment and systems running beyond expectations (EUL). The value of the extension of service life can also be weighed against the savings from energy efficiency of a replacement system, when identifying if “early” replacement is a viable option. Predicting when a building system or component is reaching the end of its service life and requires replacement is difficult without a sophisticated reliability-centered maintenance program. Given the challenges in implementing such a program in a typical facility, we are left with the manufacturer’s recommended service life and periodic facility condition assessment programs to predict annual capital replacement needs. In conducting a facility condition assessment, the level of maintenance, environmental factors, and system suitability are usually considered. These factors provide modifiers (up or down) to the manufacturer-provided expected useful life. But the application of those modifiers is far from scientific and not often data-driven. For now, the prediction of service life at the component level of a facility is our most frequent methodology for predicting service life, and is based on our judgement of the effectiveness of the maintenance program as well as environmental factors. Until we are able to provide more accurate judgement of service life expectancy, we will be providing reasoned judgement on when to replace a major building asset. However, in the case of service life extension, it is not difficult to show the economic benefit of service life extension if we are able to track capital replacement costs and apply the concept of time value of money. This article has provided a simplified example of looking at the reduction in life cycle cost as a consequence of service life extension. Although there are a number of other economic factors that can be considered, this offers a simple way to account for extension of service life as a stand-alone factor in reducing life cycle cost. With a little thought and financial skill, the economic value of service life extension can be weighed against replacements that have higher efficiency ratings and lower maintenance requirements. It may be that keeping an asset in place for a few years longer outweighs the life cycle savings of replacing the asset with a more efficient system. Delivering effective maintenance programs and keeping equipment in service longer may be the most sustainable strategy of all. It just takes a bit of math to make the business case. Do the math! Find out how new technologies and shifting customer expectations are impacting the UK FM sector, in this BIFM report April 25, 2018 In "Surveys and Trends"
Determine your company’s return on an investment in office acoustics, with this online calculator August 20, 2018 In "Products and Services » Publications"